ALLEGANY - The picture fades in on a 42-inch plasma TV at 9 p.m. sharp. The volume cranks up to 53, piercing a cramped room where viewers fixate on ESPN2. Bryan Piccioli, the rugged 28-year-old with a thick blackish-brownish beard enveloping his jawline, flashes on the screen. Light applause ripples through the room. It’s time for the World Series of Poker Main Event final table, which includes Piccioli, an Allegany native and poker professional. Here, in a remote village in southwestern New York near the Pennsylvania border, there are more silos in sight than people. Trees engulf the sloping, winding roads that provide sparse cell-phone service and seem to lead to the middle of nowhere. A cool draft trickles through a half-open window to the left of the TV. Allegany may seem like a ghost town on this Thursday night in July, but inside the Piccioli house the party has just begun. It’s conveniently the Piccioli family reunion at nearby Cuba Lake this weekend, as it is this time every other year. There are first nieces once removed and sisters-in-law and young dog-sitters wearing pajamas, sitting on wooden floors and couches in one of two viewing rooms on the first floor. There’s also Bryan’s dad, Dan, the reason Bryan fell for poker as a young teenager, 2,270 miles east of where he’d rather be. About 20 members of “Team Bryan,” as the custom black shirts read in white lettering, pack into the gallery at the Rio All-Suites Hotel and Casino in Las Vegas. Bryan's contingent there, among others, includes his mom, Diana, his sister, Lauren and his girlfriend, Karissa. Nine players remain for the $8.15 million grand prize out of the 7,221 that started. Bryan wears a black shirt with JM Bullion and 888poker logos plastered on for sponsorship money and a beige-topped, navy blue-brimmed hat. He currently sits fourth in the chip count. Thursday will narrow the field from nine to six, Friday from six to three, Saturday from three to one. Ninth place wins $1 million, with each higher finish carrying a gradually increasing slot value until poker lore adds another name. 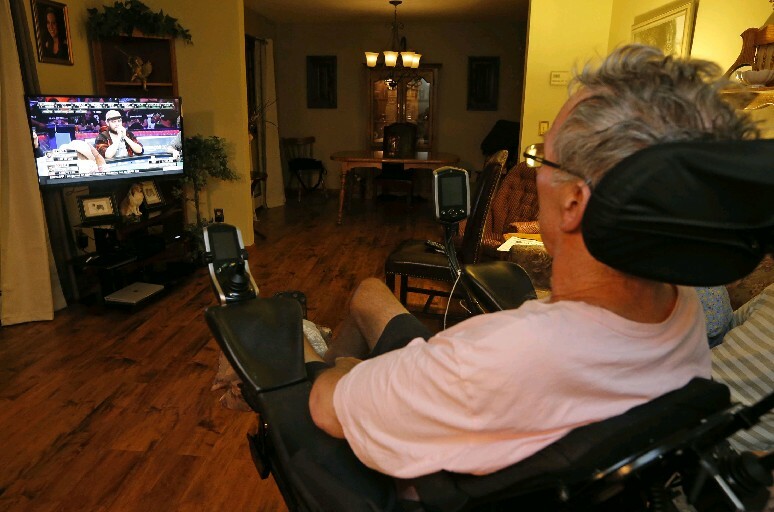 Dan rests in a complex motorized wheelchair 15 feet from the TV. He wears gray hospital socks, a pink short-sleeved shirt, navy blue shorts and silver glasses. His head eases back against a towel draped over his headrest. The soles of his feet push against two pillows nearly parallel to his seat cushion, his knees bend to the side. Each hand grips an armrest. With a slight nod of his head, Dan manages a smile. Around 10 p.m. on Aug. 2, 2016, Diana sat in the family room watching TV. Dan had just returned home, preparing to take their two dogs outside before he went to bed. Diana heard a noise in the foyer but thought nothing of it. The dogs, Shetland sheepdogs named Sammy and Scooby, ran into the family room, leashes attached. Diana thought her husband may have been waiting for them outside. Instead, he lay motionless on the floor when she checked. The leashes had tangled his hands and Dan, unable to brace his fall, landed awkwardly on his neck. Dan voiced to his wife that he just wanted to lie there for a while. When she tried lifting one of his legs, it fell to the ground. She dialed 9-1-1 twice, since the first call didn’t get the paramedics there fast enough - and they eventually loaded him onto a Mercy Flight helicopter in a clearing half a mile away, destined for Erie County Medical Center. Diana drove the hour-plus to ECMC. When she arrived, Dan still couldn’t move his arms or legs. To this day, he still can’t, and has been diagnosed as a quadriplegic, paralyzed from the neck down. Bryan had just finished a successful summer of poker, including an 84th-place finish in the 2016 Main Event, and planned a month-long European vacation with Karissa. They flew from Vegas to Stockholm to Copenhagen. 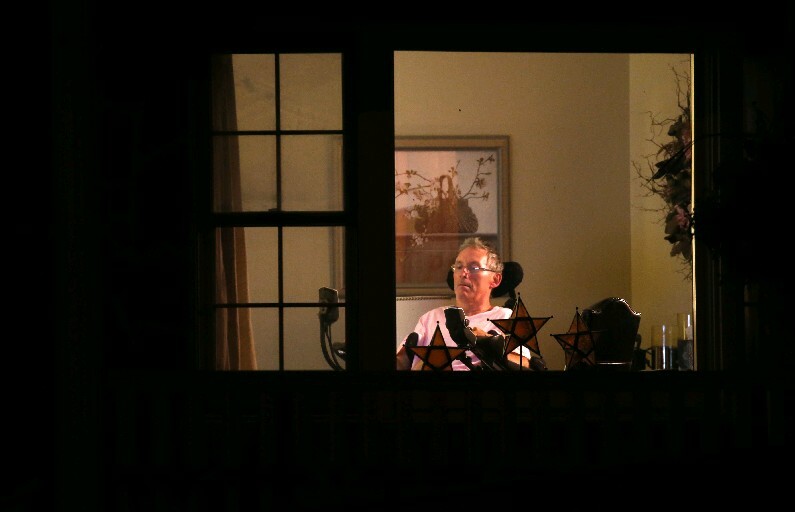 It was 2 a.m. Denmark time on Aug. 4 when Bryan’s cell phone rang in his hotel room. “It was just one of those moments where you know something isn’t right,” Bryan said. Diana had waited almost a day and a half to call, until she knew the severity of Dan’s injury. Bryan had trouble understanding her on the phone because she was crying so much. He and Karissa flew from Copenhagen to Amsterdam, then to New York City and to Buffalo. By 3 p.m. on Aug. 4, Bryan stood at his dad’s bedside, next to the man who'd always been there for him. Dan spent two months at UPMC Mercy in Pittsburgh, a top spinal cord rehabilitation facility. Doctors delicately stretched his arms and legs, used electric stimulation on his muscles and integrated computer programs to help restore strength in his limbs. Bryan and Karissa leased an apartment for two months in Pittsburgh, abandoning their vacation, and Bryan temporarily stepping away from the game to which his dad introduced him. Dan started playing poker as a junior in high school. At St. Bonaventure, he was a bookie for some of his professors. He played several times a week before his accident, most recently in a cash game in nearby Olean where someone can win or lose up to $5,000 in a night. Bryan started with low-stakes games on PokerStars.com and eventually became one of the top online players worldwide. After winning two online qualifying tournaments on the same day his sophomore year at the University at Buffalo, good for entry into live tournaments in Sanremo, Italy, and Monte Carlo, he dropped out of college with the intention of returning in the fall. Bryan profited almost $40,000 on that European trip and hasn’t returned to college since. (His parents disapproved of his decision to bail on college then; maybe not so much now). Bryan didn’t play in a serious live tournament after his dad’s injury until December 2016 in Prague. Dan, Cattaraugus County’s commissioner of social services, used sick days for work absences, which he still does today in hopes of one day returning to work. While his dad watched from afar, Bryan pulled off a poker miracle to reach this year’s final table. To make the final 10, he needed the dealer to show an eight as her last card (five-percent chance) or he was done. She did, and a manic celebration ensued. 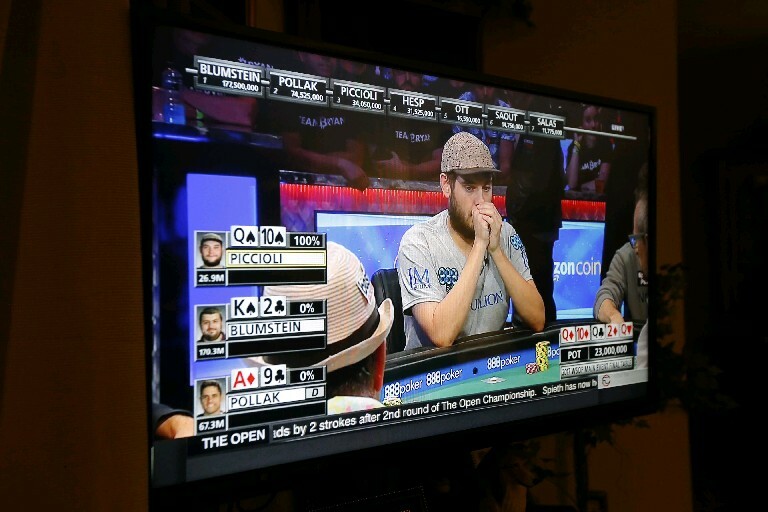 Then he faced good friend Michael Ruane for a spot at the final table, each with about a 50-percent chance of advancing. He won that, too. Dan knew he'd have to watch his son in poker’s Super Bowl from home. He just wished he could be there in person. It’s 9:57 Thursday night and the three-man announcing team on ESPN2 is talking about Dan Piccioli. About the accident. About how Bryan is playing for his dad who couldn’t make it. About how the viewing party in small-town Allegany is centered around him. Dan spruces up his son’s face time with commentary and smiles, but he doesn’t care for the attention himself. He remains stoic with the TV discussion on him, a couple “awwws” emanating from the room. On multiple occasions, Dan emphasizes, unprompted, that he doesn’t like talking about his disability. He wants this to be about Bryan. After all, he devoted his career to the social services. Being paralyzed wasn’t nearly a good enough reason to make it about him, not when Bryan gave this up to be at his side not long ago. “He is just such a selfless person,” Lauren said of her dad. “ … Just to see him continually be so positive and have such a positive outlook, there’s really no words to describe it." There’s nothing much to support through the first hour-plus of the final table, though, since Bryan folds on the first 15 hands with less than ideal cards each time. He’s dropped from fourth to sixth place with eight players remaining. “Hope that viewing party is having fun out there,” announcer Lon McEachern remarks, to which a loud cheer fills the house, drawing a smirk from Dan. He keeps his black iPhone in the room over. With a 30-minute tape delay enforced by gaming regulations, he doesn’t want any spoilers coming from family in Vegas. Thursday night turns to Friday morning and not much action unfolds on TV. Guests have started to file out and one dozes off briefly on the couch, propping up her head with her right fist. Watching poker is not for the weak. That’s why Dan is made for this. Besides, he’d be in Vegas with his son if he had a choice, and he wouldn’t fall asleep there. His son is in decent position, wavering between spots Nos. 3 and 5 with little danger of being eliminated soon. Dan refuses to take credit for Bryan’s play when someone suggests it, instead using his few words to guess Shaquille O’Neal’s shoe size since a Gold Bond commercial featuring O’Neal comes on for the umpteenth time. At 1:42 a.m., after a night of fruitless hands, Bryan draws a pair of aces. He pushes all his chips to the middle of the table, and tension skyrockets in Allegany. Lauren and her boyfriend, Ryan, got to their seats in Vegas five minutes ago. All that way for possibly just five minutes if the poker gods are on the side of England’s Jack Sinclair, in danger of being eliminated with the best possible hand up against him. Bryan has an 89-percent chance of staying alive and moving up the standings with one card left for the dealer to show. “Apologies in advance to the neighbors of the Picciolis in Allegany, New York,” McEachern says, which everyone finds hysterical. At the same time, they cross their fingers in hopes it’s not a jinx. The dealer turns over the fifth card. It’s a jack, not the one Sinclair needs. The room erupts. Dan’s smile spreads to his ears. Bryan, leapfrogging from sixth to fourth, fist pumps and embraces his gallery with open arms. With the nerves now flatlined, Mary, Dan’s sister who is caring for him while family is in Vegas, enters the room several minutes after 2 a.m. She has a text from Diana “worth sharing.” Play has been halted for the night even though seven players remain and not six. After five hours and 12 minutes, the TV clicks off. Mary directs Dan to his room for the night using a joystick on his left armrest. A good night’s sleep awaits with his son still alive for the grand prize. Dan is already talking strategy 40 minutes before Day 2’s telecast begins. It turns out to be more than that since an Orlando City-Atlanta United Major League Soccer game goes long on ESPN, extending the tape delay from 30 to 38 minutes. The fireworks come early this time for Bryan, who started the day in third. He draws a queen and 10 as his two cards. “Oh my god,” Dan exclaims as if he saw a ghost when the dealer shows two queens and a 10, giving Bryan a full house, Dan’s face lighting up at his son’s good fortune. People all over the country with connections to the Picciolis are watching. St. Bonaventure men’s basketball head coach Mark Schmidt texts Dan that he’s tuned in while in Kansas for a basketball event. One friend left a newspaper article about Bryan on the Piccioli's stoop and wrote a congratulatory message in Sharpie on the page. Dan’s phone is flooded with texts of support for his son. Everyone on TV, too, seems to like Bryan, his gregarious nature and conversational tendencies lending themselves well to the otherwise tense competition. One exception may be Argentina’s Damian Salas, who Thursday night approached the event director and accused Bryan of looking at his cards, a blasphemous accusation to those who know Bryan. He’s hurt by this, he tells his gallery in private. Bryan has the last laugh, though, since Salas is the first casualty of Day 2. The first elimination came 18 minutes into Day 1, but tonight’s first comes almost 2 1/2 hours in. Dan lets out an emphatic, “Yes! Yes! Yes!" Yet even with another body off the table, Bryan’s luck is dwindling. His cards aren’t any good, and he dips into sixth place of six players remaining. Lauren texts Mary since she knows her father isn’t at his phone, asking if he wants to relay a message of support to his son. Dan declines. Bryan has made it to the ninth day of the event without his help, and Dan doesn’t want to mess with his son’s emotions this late. Bryan approaches his gallery after folding yet another hand. The next time he gets just one ace in his two cards, he tells them, he’s risking it all. Dan’s phone begins buzzing uncontrollably while his ringtone blares in the room over. It’s 12:26 a.m. and he lets it go to voicemail. Deep down he knows who it is and what they’ll say, but he’s not quite ready to face it. Seconds later, the phone rings again. This time, Dan’s friend, Tom, swiftly grabs it, returns across the room and puts the phone on speaker. The call lasts almost 90 seconds. Both Bryan and Dan are choked up, holding back the waterworks. Bryan vows to come home as soon as possible. He has “a lot of stuff to figure out,” but it won’t be much longer. There are seven “I love yous,” father and son trading refusals to hang up so they can share just a couple more seconds together. Finally, the call ends. Dan breaks down. “I’m not crying ‘cause he got knocked out,” Dan says after the tears subside, his son now $1.675 million richer. Dan insists on watching until Bryan is eliminated on TV, another 30 minutes of father watching son at the pinnacle of his profession. In that time, he even sees a “Piccioli Strong” shirt with a heart colored like an Italian flag worn in the crowd. When Bryan pushes all his chips in with an ace and a seven, fellow finalist Dan Ott matches his chips and shows a pair of kings. Bryan needs one of the dealer’s five cards to be an ace. “I’m sure there’s chants of ‘ace’ back in Allegany, New York,” the announcer says. But here it’s silent. Everyone already knows what happens. The dealer now has one card left to show, and there’s a seven-percent chance it’s an ace. No miracles this time. The inevitable still drops like an anvil in the room. Bryan’s run finally ends on TV at 12:52 a.m. here Saturday morning, after almost nine hours of play over two days. A $1.675 million payday seems like a consolation in the moment, but it’s more a coronation for the Picciolis, especially for a father and son a whole country apart but never closer than now.